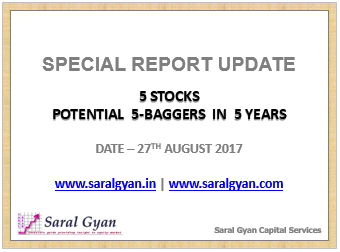 We are pleased to inform you that 4th Issue of our Special Report Update 5 Stocks - Potential 5-Baggers in 5 Years in August 2017 will be released today (by end of the day) on 27th Aug'17. The report will be shared with our Hidden Gems, Value Picks and Wealth-Builder members. Our 4th Issue of Special report includes performance update of 5 companies which were recommended in our 3rd Issue of this report published last year on 05 June 2016. We have evaluated results of last financial year of these companies and suggest necessary action with hold / sell / buy update. This Report covers company's background, recent updates and developments, investment rationale along with our views and recommendations. Importantly, report also includes update on any exclusion of existing stocks or inclusion of new stocks to ensure that these stocks can deliver 5 times returns over a period of 5 years. However, our team is confident enough to achieve 5 times returns in period of 5 years by monitoring performance of these companies every year and taking corrective measures in case any of them does not perform up to our expectations. Now, let us review the performance of our 5 stocks over last 2 years against major indices Sensex and Nifty. Below table indicates the performance of our Potential 5-Bagger stocks during 1st year. We reviewed these stocks in 3rd issue of our Special Report released last year on 05 Jun'16 and below is the performance update as on 5th Jun'16 along with suggested action. In our 3rd issue of Special Report released on 05 June 2016, we informed our members what strategy needs to be followed going forward with these 5 stocks in terms hold / exit or add on dips update. As indicated in the table above, we suggested to hold 4 out of 5 stocks with buy / buy on dip approach to new members who were not holding these companies. Moreover, we suggested to switch from one of the existing stock to a new stock taking a fresh entry into it. We are glad to share that the stock which we included last year as one of the Potential 5-Bagger stock with buy recommendation has given whopping returns of 223% in period of 15 month. Below is the as on date performance of our Potential 5-Bagger stocks since release of our 3rd issue on 05 Jun'16. We are glad to inform our readers that our carefully picked 5-Bagger Stocks have delivered returns of 67.8% against Sensex returns of 17.7% since release of our 3rd issue of special report on 3rd Jun'16. Moreover, our potential 5-Bagger stock picks have given average returns of 101.5% as on date against Sensex returns of 17% (27011 - 31596) and Nifty returns of 20.5% (8181 - 9857) during last 2 years (since 5th May'15). In continuation of our effort to ensure that our members get rewarded getting better returns on their investments in medium to long term by investing in good quality small and mid cap companies, we will release our 4th Issue of Special Report - Potential 5 Baggers in 5 Years Update today on 27th Aug'17 (by end of the day) with suggested changes in terms of any new stocks inclusions / existing stocks exclusion to ensure that we achieve 38% CAGR returns. If you wish to receive 4th issue of our Special Report 5 Stocks : Potential 5-Baggers in 5 Years Update (to be released by end of the day today on 27 Aug'17), simply subscribe to Hidden Gems, Wealth-Builder, Value Picks or any of our combo packs and we will send you the report without any extra charges at the time of release today (by end of the day). You can avail attractive discounts by subscribing to our combo packs. Below are the details of our annual subscription charges, simply click on SUBSCRIBE! link to subscribe to our services online using debit / credit card or net banking facility.